Packed with an irresistible combination of sweet and salty ingredients, you won’t be able to stop at one handful. 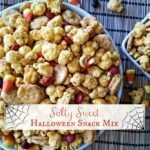 Serve a bowlful of Salty Sweet Halloween Snack Mix at your next party. Or any time you want a special treat. Preheat oven to 250 degrees. Prepare a large cookie sheet by greasing liberally with butter. Alternatively, line the cookie sheet with parchment paper and grease with butter. Mix the popcorn, crackers and peanuts in a large bowl. Set aside. Combine butter, corn syrup and sugar in a medium saucepan. Bring to a boil over medium heat. Stirring constantly, continue cooking for 5 minutes. Add vanilla and baking soda (mixture will bubble). Mix well. Pour sugar mixture over popcorn mixture and stir to coat ingredients. Pour onto prepared pan and bake at 250 degrees for 45 minutes. Every 15 minutes remove pan from oven and stir. Break mixture apart while still warm. Once cooled, add M&M’s and candy corn. Toss to mix. This recipe can be made several days in advance. Nutrition information provided as a reference.